"Jillian's Flower Basket" is a beautifully detailed ceramic tile mural with realistic flowers in full bloom, tended by hummingbirds and bees in a pretty wicker basket. The flowers depicted are rose, iris, freesia, pansy, lily, tulip, foxglove and more. 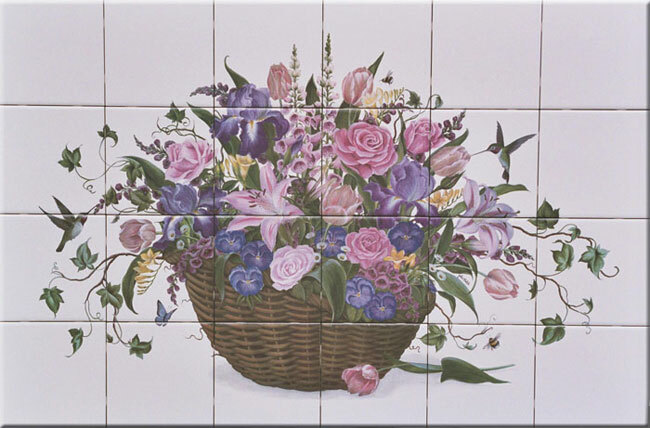 Coordinated accent tile subjects include many of the flowers and butterflies. Shown on 6"x 6" Tile Available on white glossy, white matte or simulated travertine. Size of Artwork: 33" x 21" On 6"x 6" tile: 36" x 24" Accents available on 6"x 6". If diagonal grout line orientation is required, please specify in "Contact Us". This large mural is well suited for installation as a backsplash behind the stove, in a shower, over the tub, on a wall or behind the barbecue. The artwork is a limited reproduction of an original painted by tile artist, Julie Hatch, in her Southern California Studio. Julie has been hand-painting ceramic tile for her clients since 1984. The artwork is permanent, will not scratch or fade in ultra violet light and is suitable for indoor or outdoor use. If you are unsure of the suitability of your chosen tile or how its background color will appear in the mural, or if you just wish to verify the quality of Bloomingtiles® murals before placing an order, Bloomingtiles® will process a single tile as a proof and ship it to you for approval. Just mail one of your chosen tiles with $10.00 S. & H. or specify one from Bloomingtiles® stock in the drop down menu and charge the $10.00 to your credit card. This charge will be subtracted from any future order.